Tona is back with his NEW video “Street of Dream” featuring Ayah. 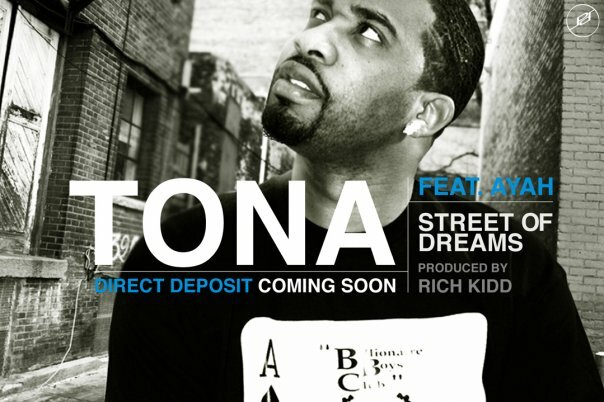 With less than a month away, TONA is preparing the release of his EP Direct Deposit which hit stores and iTunes on June 2nd. The video embodies what the track about – displaying various scenarios of peoples day-to-day lives. Gotaa LOVE TONA. Real Hip Hop!!! Special shout outs to Castro, Boots & Rich Kidd for their cameo appearances. Remember to mark June 2nd and grab Direct Deposit EP. Enjoy the video! Toronto STAND UP! Video Directed by the Unseen Movement.